Jude Spero, of Little Louise Designs has been quilting in some form or fashion since the 1970’s. Influenced by her Grandmother who worked in the textile industry, Jude designs original patterns for several companies including Timeless Treasures, Island Batik and Quilting Treasures. Her adorable feline, Louise, is the inspiration for her company name. Read more to discover her best advice and tips for quilters and to learn more about her quilting companion, Louise. QW.com: How would you describe your quilting style? 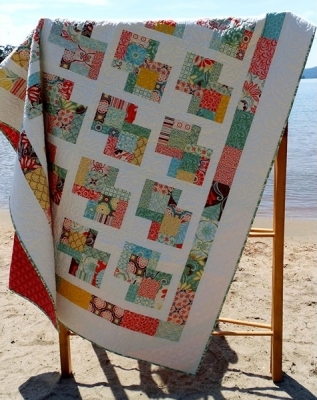 LLD: I would describe my quilting style as rather eclectic. I love the Vintage Modern look and I’ve been working with a lot of Batiks. I do everything from Modern, Traditional, Folk Art, Northwoods to 30’s styles. QW.com: You named your company after your cat, Louise. Can you tell us more about her? 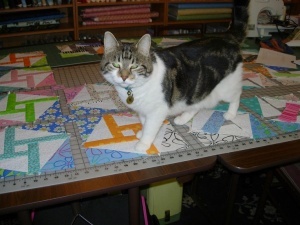 LLD: Louise has always loved playing around with my fabric. Any time I would be working on a project she would come down to the studio to help. I love making scrap quilts and have many baskets of scraps of varying fabrics. Louise would dig around in the baskets and low and behold she always managed to pull out just the right piece I needed. Over the years this has escalated into her being an outright cat burglar! Every night Louise goes down to the studio and steals fabric. It could be anything from a bunch of pieces I have cut out for a project to a Jelly Roll or Charm Pack. She particularly loves Fat Quarters. Every morning when I wake up I find fabric or quilt blocks, you name it, all over the house. 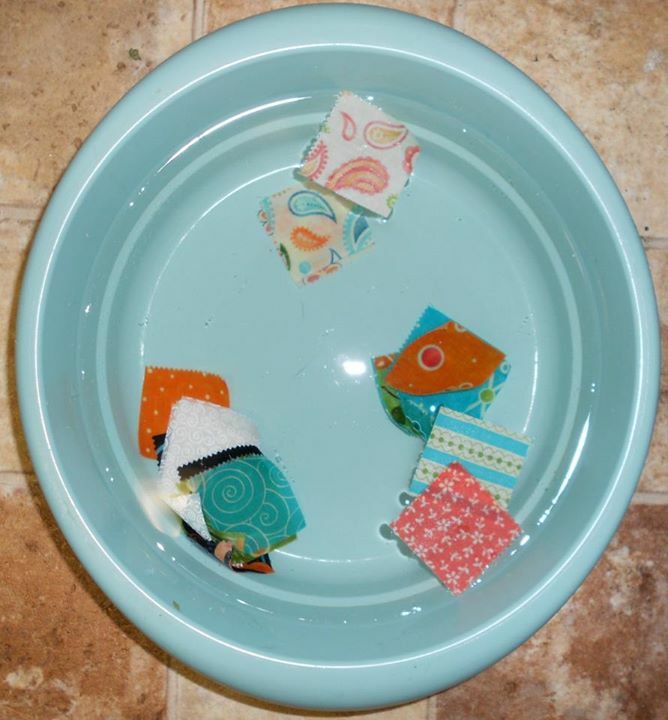 She has even per-washed fabric in the dogs water dish. QW.com: What are your best-selling patterns? LLD: My best sellers are Danish Delights, Saturday In The Park, Gateway To Paradise and Monkey Bars to name a few. QW.com: A lot of our readers tell us that they have trouble finding more time to quilt. What advice would you give them? LLD: My best advice is #1, always do a test block before you begin. #2, organize yourself and cut everything out and have it ready to sew next to your sewing machine. This way you can just sit down and sew for a few minutes or a few hours and still accomplish something. QW.com: What patterns would you recommend to beginning quilters and why? How about the more advanced? LLD: For beginners, I would recommend Danish Delights, California Dreaming and Gateway To Paradise. These patterns are easy, straight forward and are a great introduction to pre-cuts. 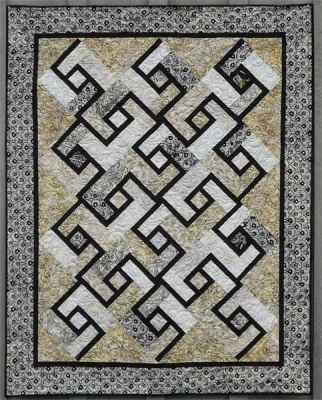 For more advanced quilters I would recommend Twisting With The Stars, Celtic Landing, Outside The Box and Monkey Bars. These patterns are a little more challenging but a lot of fun to do. 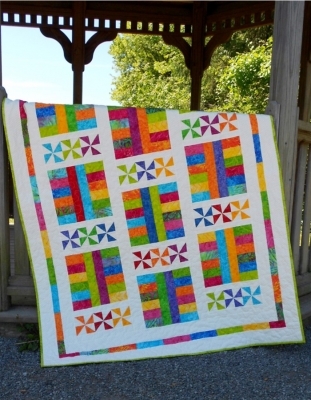 QW.com: What are your some of your favorite quilting tips? LLD: I love any kind of quick piecing techniques. Some of my favorite tools I use are the “Quilt In A Day Flying Geese Ruler” and “The Angler 2 by Pam Bono Designs”. For half square triangles I like to draw a grid on the wrong side of the lighter fabric. I then draw diagonal lines across the squares. Place the right sides together with the darker fabric and sew ¼” seams along both sides of the diagonal line. Cut it out on the drawn lines and presto, you have a whole bunch of half square triangles in no time! QW.com: Besides Quilting and Sewing, what else do you like to do? LLD: Besides quilting and designing I play the guitar and mandolin. I also do Tai Chi and am beginning to learn to do the Chinese Swords. Sounds kind of crazy but it’s really cool to watch, it’s like a dance. These activities are great for my mind, body and spirit. Kind of a mental health break! QW.com: Where can I readers lean more about you? LLD: I am having a new website built ,www.quiltpatternsplus.com, where I will finally have my own Blog. I plan to possibly have a weekly “Little Louise Cat Burglar Challenge”. This would involve the challenge of making something with Louise’s stolen goods. Thank you for joining us for uur interview with Jude Spero of Little Louise Designs. This entry was posted in Designers, Helpful Tips, QuiltWoman and tagged Jude Spero, Little Louise Designs, QuiltWoman.com. Bookmark the permalink.